There’s no denying the array of food options in San Diego County. 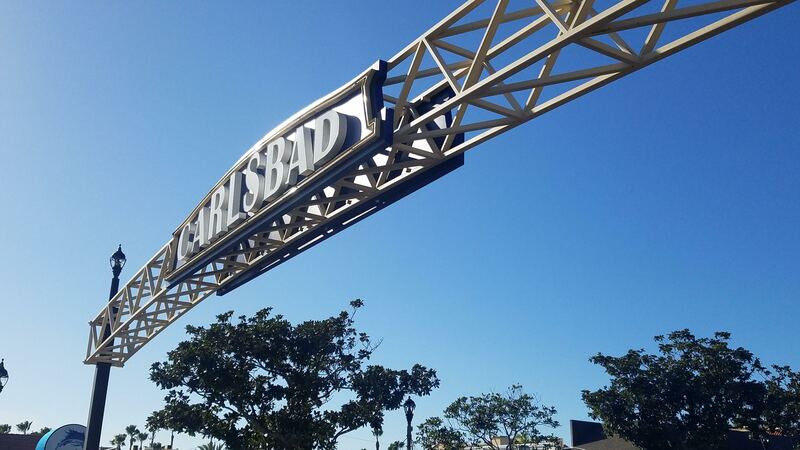 One of the most popular spots to get your grub on is Carlsbad. Filled with cafes, wine bars and fine restaurants, I was thrilled to head down recently and take the Carlsbad Food Tour. A favorite among locals and visitors alike, the Carlsbad Food Tour enables attendees to experience a little bit of everything to taste in town. Of course, my burning question was, how gluten-free friendly is the Carlsbad Food Tour? Luckily for all with dietary restrictions, the tour is accommodating and goes beyond simply sampling a dish and moving on. 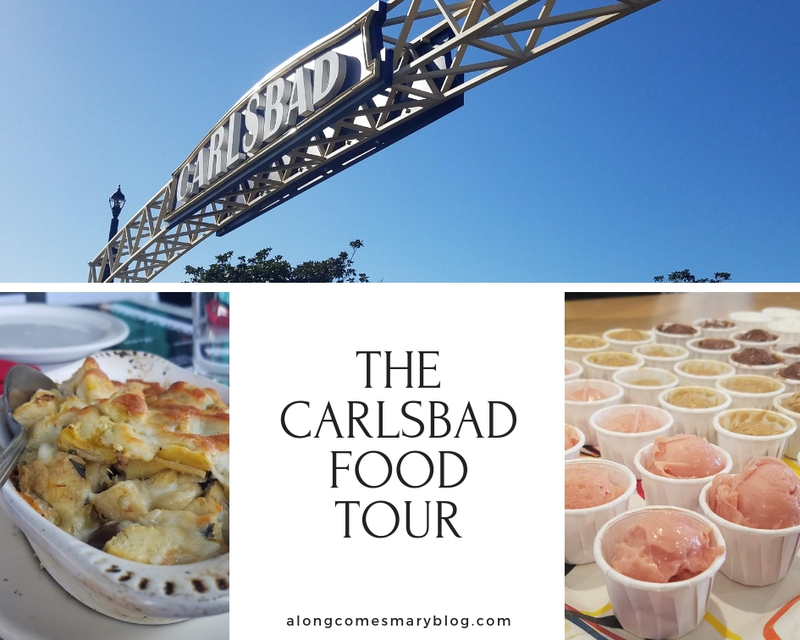 Read on to learn more about the delicious stops we made on the Carlsbad Food Tour! Founded in 2014 by Cherimarie and Brad Poulos, the tour embraces the couple’s beliefs of leading a health-conscious lifestyle. That includes walking, eating healthy foods, small frequent meals and socialization. All of which are the essence of their food tours. While the Poulos are currently in the Bahamas, our group was in excellent hands with David Jenson, the company’s lead tour guide. Jenson has such a vibrant, infectious energy and clearly adores what he does. 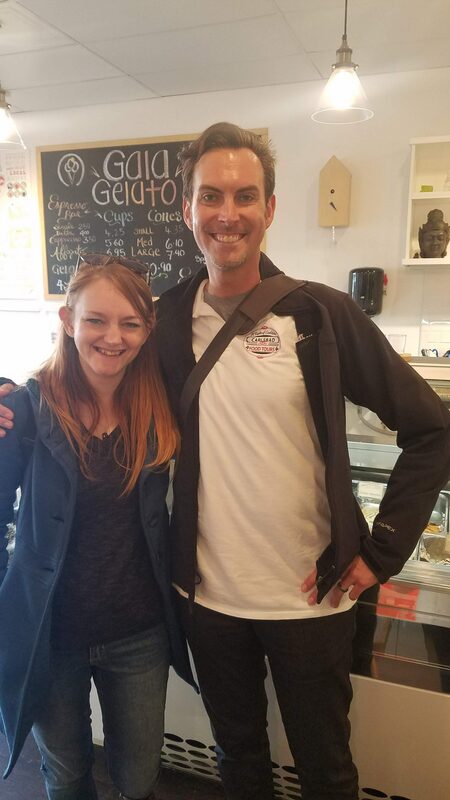 With an eclectic background that includes working for 20th Century Fox, Jenson also acts as a historian of Carlsbad and leads numerous walking tours. I loved that we were treated to a plethora of information on the city as we walked and dined. Who knew that alkaline water was discovered in Carlsbad? Or, that the first avocado tree was planted within the city limits? Meeting up promptly at 11:30am, one of Davids first questions was if there were any food restrictions in our party. Moving forward, he ensured every effort was made to get appropriate samples as we visited 6 favorite restaurants in Carlsbad. We started the day with some of the best Italian in town at Caldo Pomodoro. Meaning “The Hot Tomato,” Caldo Pomodoro is all about preparing the finest marinara and pizza sauces. The unique way their sauces are prepared lay in the slow simmering process. This cooks out the acidity in the sauces which makes for a more bold, smooth flavor. Siblings Fran and Gina Brancis opened Caldo Pomodoro in 1991 following Fran’s impressive career as a hair stylist in Beverly Hills. Trading in the Hollywood glamour, diners will often catch Fran sweeping out front of his restaurant. While inside, Gina leads the kitchen and cooks up mouth watering plates like sauteed calamari and even grinders, traditional Sicilian sub sandwiches. Caldo Pomodoro boasts an extensive menu and offers gluten-free pasta and pizza. During the stop, I was able to try their baked artichoke hearts. 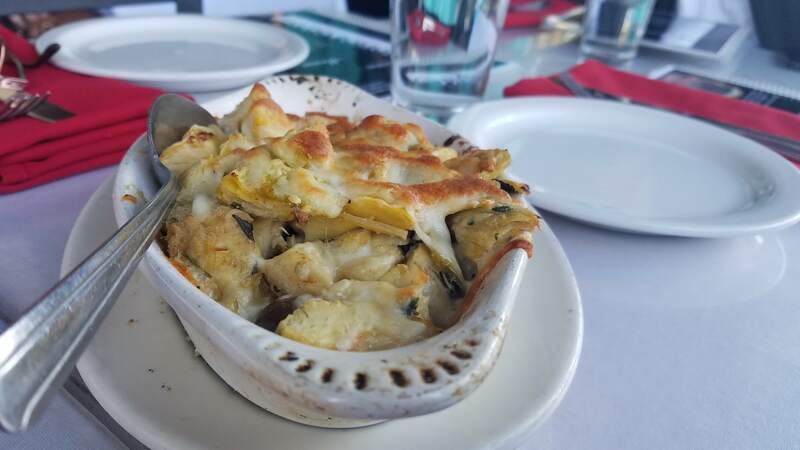 Unlike any artichoke hearts I’ve ever had, this appetizer was filled with mozzarella cheese and olives inside. Instead of over powering the artichoke, it complemented it extremely well. It nearly made for a meal in its self. The table also got to try out one of their famous meatballs but, alas, was not gluten-free. Following an Italian stop, olive oil tasting seemed fitting. We dashed across the street to Humble Olive Oils, which for a group of food writers is more like “kids in a candy store.” Humble Olive Oils offers shoppers their traditional oils and balsamic vinegars in addition to some very unusual flavors you can’t find most places. I went straight to the infused olive oils and enjoyed self-seve samples of flavors like garlic and blood orange. My favorite had to be butter since it would be perfect for popcorn for those avoiding dairy. While I’m not much of a balsamic vinegar fan, how could you resist trying kinds like espresso and chocolate? These were actually vinegars I could get on board with. I was especially surprised at how fragrant and flavorful a lavender flavored dark balsamic was. 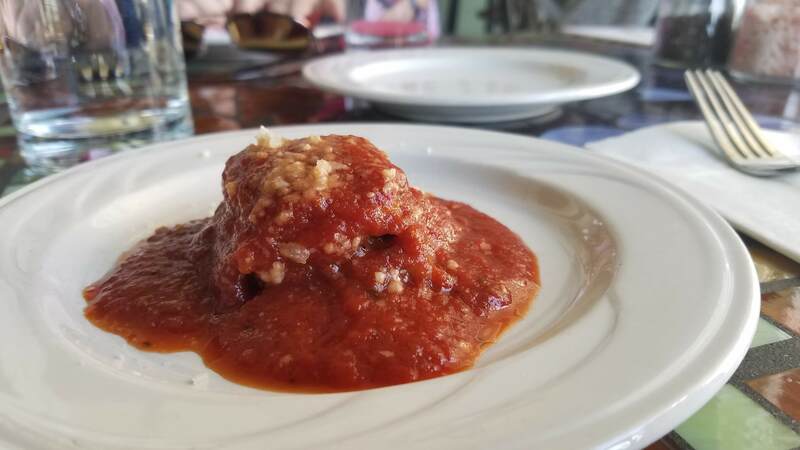 Carlsbad loves their Italian food, and that’s fine by me. After the wonderful tastings at Humble Olive Oils, we headed over to Village Faire, a popular shopping plaza located in the heart of the village district. Brimming with inviting shops, salons and cafes, David had us make a bee line upstairs to Gregorio’s Italian Restaurant. A laid back, family atmosphere welcomes you as you decide on a seat inside or on their gorgeous patio overlooking the city. Decadent trays of their famous eggplant sliders were soon coming our way. Eggplant parmigiana on mini sweet buns with marinara sauce are a crowd-pleaser at Gregorio’s. I got to experience one myself sans the sweet bun and it still managed to hit the spot. After taking a peek at their menu, I was pleased to see gluten-free pizza and pasta are available. I look forward to returning to both Gregorio’s and Caldo Pomodoro to enjoy more of their gluten-free options. Witch Creek Winery was a highlight among our stops. Originally founded in 1993 before moving to Carlsbad in 1996, Witch Creek is San Diego’s oldest urban winery. Sharing their space with Sleeping Tigers Coffees, the lively vibes quickly made me feel alive-and I hadn’t even tried any wine or coffee yet. As you enter from Carlsbad Boulevard, Sleeping Tiger and their baristas hard at work greet you on the right, while on the left is Witch Creek’s wine bar. A full house on a busy weekend, I loved how family and dog friendly the environment was. Groups of the food tour get to enjoy 3 tastings that start off with a sparkling Chardonnay from Cool Cat, which was a perfect way to toast such a fabulous day with friends. With an intimate live stage, we learned at this time that David and his wife have a band entitled The Journey Birds and often perform at Witch Creek. How can you visit San Diego and not have tacos? There should be a law against this. After a visit to Carlsbad’s Alkaline Water Company, we proceeded to Senor Grubby’s. A favorite among the locals, Senor Grubby’s offers up all of your usual “hole in the wall” Mexican fare. Known for their street tacos, I tried a carnitas for my first time and it was excellent. Shredded meat on a corn tortilla and filled with sauce and spices. Listen up, breakfast lovers. Senor Grubby’s serves up several classics daily until 11:30, with a few plates available all day. Enjoy their “American” style with toast and potaoes, or “Mexican” style with rice, beans and tortillas. Definitely alert them if you’re gluten-free as some tacos and dishes are not. As we began to wrap up our tour, it was time for some dessert. At Carlsbad Chocolate Bar, enjoy the best of both worlds with a chocolate counter, coffee bar, gift and wine shop. While many chocolates are made in-house daily, others are imported from fine chocolateers around the country. Fans of Marilyn Monroe (and wine) will love the shop’s line of Marilyn Merlot wines. If coffee is on your mind, you can order up a latte and enjoy beans roasted for the shop from La Costa Roasting Company. While more of a “pit stop,” we stopped in for a sea salt caramel chocolate before heading to our final destination…. If you think you’ve had gelato, think again. 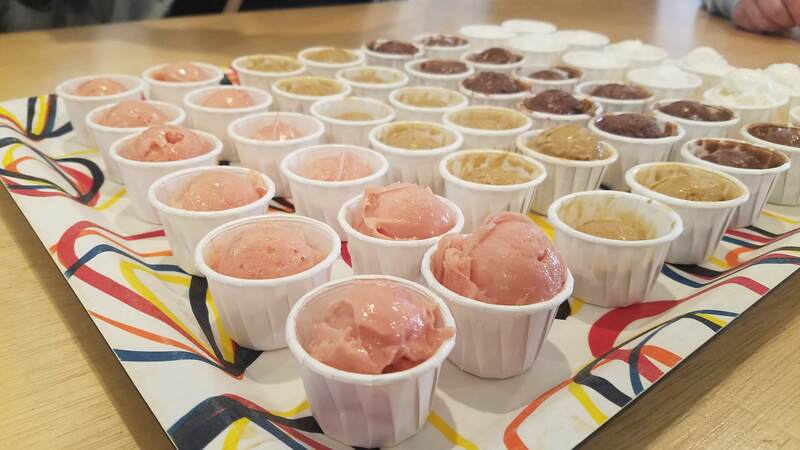 Gaia Gelato was founded by Italian natives who studied the creamy treat back home before arriving in San Diego County to share their knowledge and love for Italy’s favorite ice cream. All machinery used is imported, and the gelato is crafted daily in small batches. We no sooner sat down and trays of samples were before us. Orange citrus (dairy-free), espresso, chocolate and honey-lavender were on the menu. The espresso tasted like I was having a cappuccino, while the orange citrus did not scream “no dairy” (always a good thing). Although, my favorite had to be the lavender-honey. Light and sweet, I bet this is the scoop I order when I return to Gaia. Even though some items were restricted due to being gluten-free, this was still a fantastic tour. I’ve been sold on many restaurants and cafes that I cannot wait to return to. Learn more about the Carlsbad Food Tour and book yours HERE.